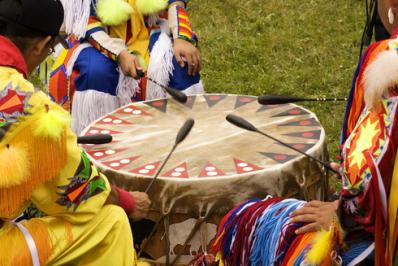 The drum is an integral part of modern powwow celebrations, providing the base rhythm for a wide variety of dance styles. 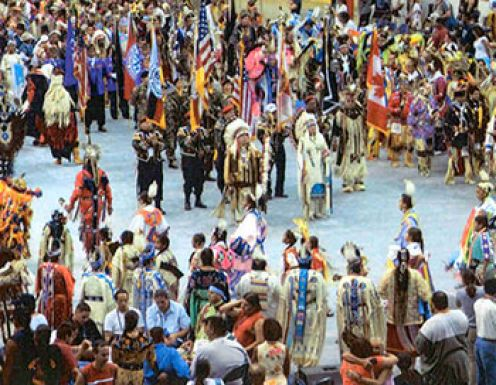 Like every other surviving culture, powwow music continues to evolve. Enjoying new types of music can require an adjustment period. Native lyrics are often a combination of vocable sounds and Native words. While hundreds of songs exist in various Native languages, most are categorized as either Northern or Southern. Northern style is faster and the singing has a higher pitch. Here are several of my favorites from back-in-the-day when I bounced around the social circuit and enjoyed hearing the drums and watching the dancers. If you’re interested in learning more about these pan-Indian celebrations and would like to visit an event, check out www.powwows.com and locate the genuine article in your local area. The rules are simple: learn proper powwow etiquette, listen to the MC, and be respectful – ask before taking photographs and don’t touch anyone’s feathers. The larger powwows are more commercial in nature but also provide a less insular community for outsiders. They also offer bigger prize money for dance and drum competitions which brings in more dancers and better-known drums. The larger the crowd of spectators, the better the selection of art vendors, so it’s a win-win for everyone. Come socialize – everyone is welcome. This entry was posted on November 14, 2013, 3:00 am and is filed under Music. You can follow any responses to this entry through RSS 2.0. You can leave a response, or trackback from your own site.